Game reserves and safari lodges are essentially very eco-friendly, and without them (and tourists they attract) far less land would be set aside for conservation and the protection of Africa’s magnificent wildlife. Permanent structures are not allowed in more sensitive habitats, meaning that many lodges and camps can be taken apart and moved to another location allow the land to recover, and even in instances where permanent buildings are used these tend to use solar energy to reduce their impact on the environment. The one thing that has always seemed less than ideal, however, is the use of petrol or diesel powered 4×4 vehicles for game drives. 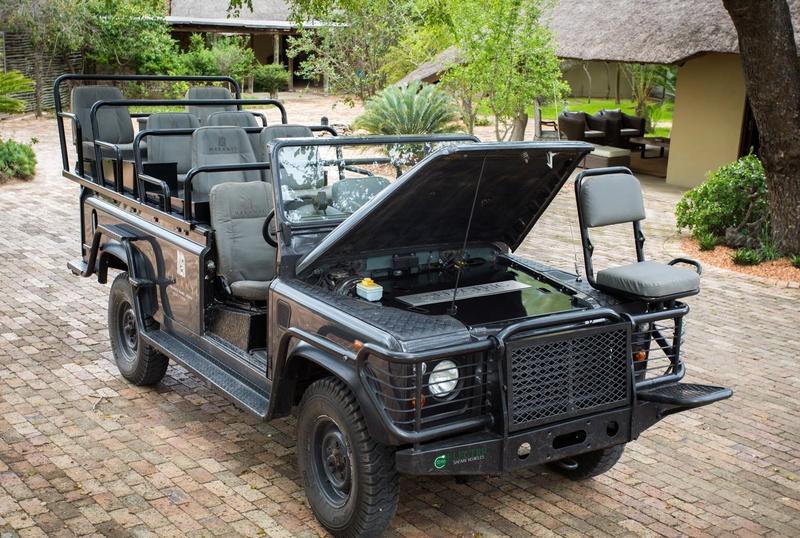 Whilst the animals themselves are usually not particularly bothered by noise of the vehicles, especially in well established reserves, it is good to hear that Cheetah Plains, in the Sabi Sands, and Makanyi Private Game Lodge, in Timvabati, have become among the first game lodges to introduce electric vehicles for game drives. There have been occasional trials of electric vehicles in the past, most notably by Londolozi, however development stalled and it is only recently that a company in Nelspruit has started offering to convert traditional petrol or diesel vehicles. The vehicles are recharged from solar panels and a full charge lasts around 6 hours on average, which equates to between 150 km and 200 km depending on the terrain. Given most game drives only cover less than 40 km, the chances of getting stranded in the bush are minimal (although this has happened to me a couple of times in petrol vehicles…). The vehicles are water proof and dust proof, and can operate as four-wheel-drive across all types of terrain with excellent power and torque. The smooth drive of the vehicles will also provide a better platform for taking photos and videos to capture scenes without the vibration and noise from the engine. I have not had a chance to go out on one of these vehicles as yet, but hope to in a few months when I am next in the Kruger area. From everything I have heard so far this sounds like a fantastic development and something from which the environment, animals and guests will all benefit.